Well folks, it looks like my first Kickstarter project Quiet Strength Kickstarter isn’t going to work. There are only 12 days left and I still have only one backer so it looks like I am going to have to take some time and rethink how I approach this project. I am taking some advice from the creator of my favorite tv show Babylon 5 by J M Straczynski and not being afraid to fail. I have actually done this a lot in my life by pushing myself outside comfort zones even if it meant I could fail; however, I don’t believe I ever went into these situations with that in mind. In most cases I have put myself under a lot of stress because I never felt like I could just walk away from the situations without serious consequences. That is not the case here; however, I did really need this to succeed and I also had a lot of hope that it would. In the end though, life will go on. From here I will be looking at some information shared by smirtouille on her successful campaign and work on some projects that will hopefully enhance my next offering. I will have to plan the advertising better (I used facebook ads but really did not know how it all worked) and organize the rewards from the start (added more as I looked at smirtouille’s campaign). The largest part of my errors came from being very cautious on spending money initially since I am completely broke at the moment. I had to be very tentative on what I spent because I was waiting to start my new job and have been accumulating bills. I will have to look at ways to overcome this issue. All in all, while the campaign has not worked out, it has been a learning experience that I do not intend to give up on. So look for another campaign once I have worked through the mistakes of this one. Thanks to all those that have liked my facebook page for this project and the one person who backed it. Hopefully, as my blog continues to expand, I will have more interest accumulated in my creations to make the next project successful. This past year has been a challenge and growing experience for me. I launched my Patreon page late in 2015 and, while it has not taken off, it has helped me to significantly increase traffic to this blog. During this time I struggled to maintain my various accounts as I worked at an increasingly hostile job. A job I was recently let go from. However, I did not allow the uncertainty of my new status to keep me from trying to achieve my goal of making an income from my creativity. As a result in addition to my Patreon page, I created a kickstarter campaign to bring prints of my work to a larger audience. This alone has been a learning experience with me discovering how to set up ads on Facebook to try to draw in traffic to my campaign. I also reached out to someone with a successful campaign for tips. Unfortunately, their advice was to drop the campaign for now. I did use ideas gleaned from their project to enhance what I was offering, but even if the campaign fails, I feel that I have gained knowledge that will help for the next effort. Over the last four weeks of being off, I have taken time to focus on unfinished projects, while I waited for paperwork to clear for my new job. With one painting done I plan to get two more partial projects finished before moving into new ones. Hopefully, I will have some exciting stuff for you soon. If you can, please support my efforts anyway you can. I have made major improvements to the look and reward structure of my Kickstarter project. 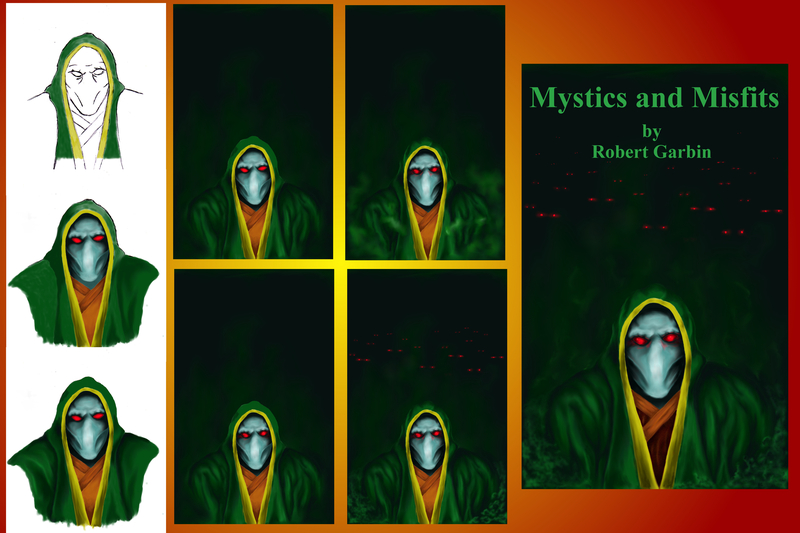 Please stop by and take a look, I really could use your support. I have added a new reward tier to my Kickstarter project. For a $5 pledge, I will send out jpeg files detailing the progression from drawing to finished painting. You can see where I started and the choices I made to reach the final image, which is great for someone that likes to see how things are done. I have been busy working on the Termanicz project but I am also spending time adding information to the Kickstarter project to show the value. 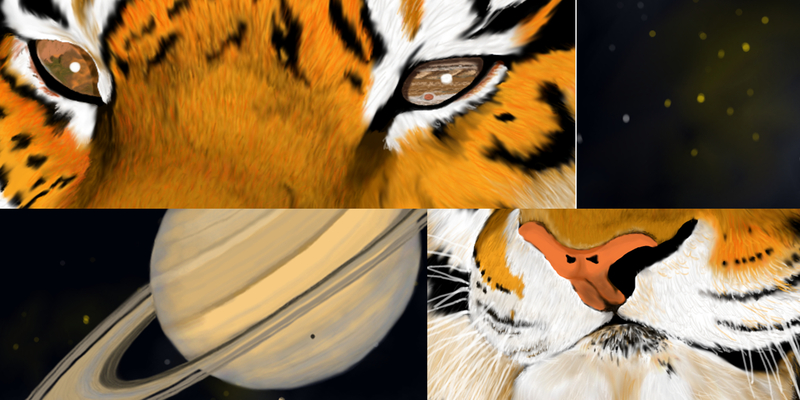 I have included a close up of the tiger to show off the eyes that can be seen in the print and also an image of the actual print and documentation for the $30 reward. This is a great value for $30 because the image size is 10.5″ by 25″ with a 1″ border making the distinctive eyes of the tiger clearly visible without increasing the cost of the print by tripling the size. 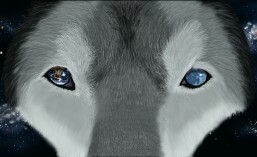 Finally, I have included an image of the painting I would like to print next “Universal Eyes – Infinite Sadness”. Please consider supporting this project. For only $30 you could get yourself an iconic image that will catch the eyes of anyone that sees it. Better yet, get several as gifts and help me continue bringing great content to this sight and please pass on this post. P.S. I forgot to mention that the shipping and handling are already included in the $30 reward level. Kickstarter Campaign for “Quiet Strength – Silent Vulnerability” Prints is now Live! Yes blog followers, I have officially started a Kickstarter project to fund a 300 print run of my digital painting “Quiet Strength – Silent Vulnerability” (Quiet Strength Kickstarter Project). Please pass the word along to anyone you think might be interested. Also, consider getting a print for yourself or as a present for someone. All the details can be found at the site along with some history about me and the project. The hardest part about trying to fund the prints is making sure people get a reward. Most of the methods allow for random donation amounts, which I don’t like because I need a specific amount per print to make this cost effective for me to share the reward. In addition, I would feel bad getting funding from someone that I could not afford to give a reward to. I would like to be able to say that I need 300 people to pledge $25 or $30 each to make the print run happen, nothing in between or ambiguous. The only thing I can think to do is give people that decide to donate, but at a lower amount, would be a digital copy of the image or maybe the coloring page I created. Do you guys think that is a fair compromise? I want to fund this very badly but I don’t want to rip people off either. That is just my nature.